Can you ever have too many pincushions? That is the question. 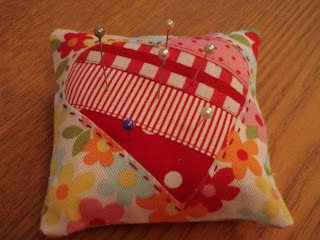 I made this sweet little pincushion with a tutorial I found at Happy Together. Have a go at making one... you'll be inspired to make another and another and another... the tutorial can be found here :-) It's such a great blog to read with lot's of tutorials.